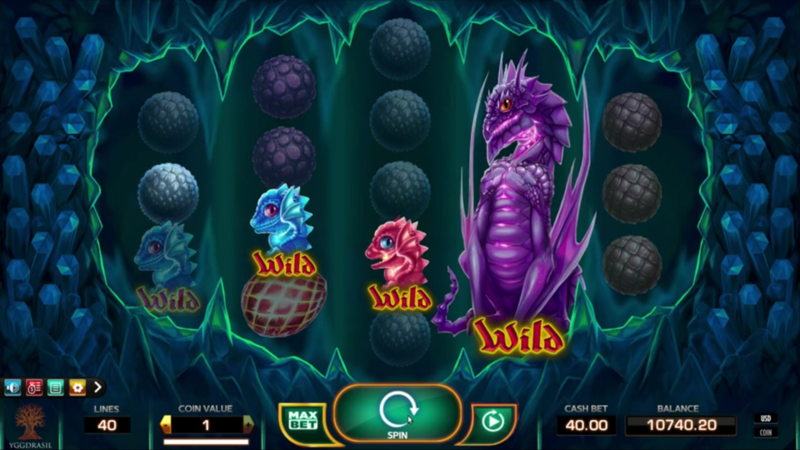 Yggdrasil Draglings is a 5-reel 3-row video slot machine with 40 paying lines taking you in the world of mighty dragons where you can score a jackpot of up to €38.000 with a little help of rewarding features such as Free Spins, Wilds and Expanding Wilds with Re-Spins. You can enter the free play mode with enough credits to get the first impression, while the Draglings slot review is just about to show you some tips and learn how to win, so keep on reading. Want to see how Draglings works? Select a recommended casino site from the list below and start playing for free or real – our screenshots will give you a sneak peek! The paytable is spread over a diamond-shaped window and pays for a combination of 3-5 matching icons placed from the left to the right side. Start by defining your betting strategy and define the coin value which goes from €0.005 to €1. Form a winning combination with 3+ matching icons of which different colored dragon eggs have a bit higher rating and pay up to 750 coins when you get 5 red ones. The baby blue dragon works as the Wild and is able to substitute any other except the scatter. The purple dragon appears on the middle reel and acts as an Expanding Wild that covers neighboring reels and grants 1 free spin to help you land a big win. Get 3, 4 or 5 scatters appearing anywhere on the reels to receive 10, 20 or 75 free spins, respectively. This bonus round can be re-triggered if you manage to collect more scatters before it ends. Moreover, you’ll benefit from the red dragon that eliminates non-winning icons by placing fire balls on them and leaves more space to get ones that will actually make a winning combination. You can play this title on mobile too. All options including demo are available without having to download an app for Android or iPhone. 3. What is the RTP factor of Draglings? Officially, the RTP at the Yggdrasil -powered sites stands at 96.40% which is able to create winners quite often. With its interesting concept that focuses on early days of the most powerful creatures ever, Draglings also brings an appealing interface combined with nice background music and all that serving to a greater cause – attractive money prize.